Great Forest is the woodland region forming a C-shape north, west, and south of the region Heartlands, the border being roughly formed by the Red Ring Road. Jerall Mountains borders on the north, Colovian Highlands on the west, and West Weald on the south. It also shares a short border with Nibenay Basin on the east and Nibenay Valley on the south. The Orange Road slices across the northern portion of the region, with the Silver Road going up through the north, the Black Road going across the west, and both the Green Road and the Gold Road going down through the south. 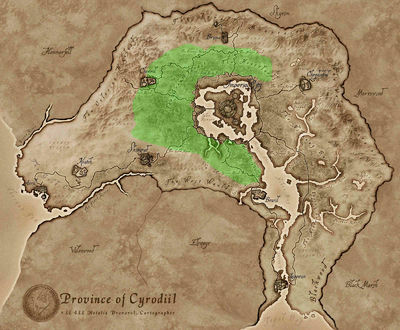 Within the Great Forest, the city of Chorrol is situated on the western edge. The forest is home to a host of different plants. One of the densest concentrations of Bergamot plants is here, along with Summer Bolete mushrooms, Viper's Bugloss, and Monkshood. Other plants include Clouded Funnel, Fly Amanita and Green Stain mushrooms, Motherwort, Primroses, Somnalius ferns, and St. Jahn's Wort. Lastly, Steel Blue Entoloma grows almost nowhere else. 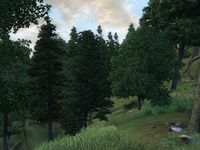 Gold Road — Main road from the Imperial City to Skingrad, Kvatch and ultimately Anvil. Orange Road — Main road from Chorrol to Bruma. Red Ring Road — The ring road circling Lake Rumare (and the Imperial City). Silver Road — Main road from the Imperial City to Bruma. Lake Rumare — A large lake surrounding the Imperial City. A list of all quests involving the region of Great Forest. The Unbeaten Path: Follow the clues given to you by a mysterious note and a strange longsword in order to find an unusual treasure (non-journal). This page was last modified on 7 October 2018, at 18:53.